Texas Rangers second baseman Rougned Odor has been named the American League Player of the Week for the week of Sept. 4. Major League Baseball made the announcement Tuesday afternoon. For the honor, Rougned batted .444 (12-for-27) with six runs scored, two doubles, five home runs, 15 RBI and a stolen base over six games to claim his second career AL Player of the Week Award, last winning with the Rangers on July 26, 2015. Among his AL counterparts, Odor finished the period first in RBI and total bases (29), tied for first in home runs and extra-base hits (7), second in hits and slugging percentage (1.074), and sixth in batting average. Odor delivered the game-ending two-run homer in Tuesday’s home tilt against the Seattle Mariners. It was the club’s sixth walk-off win of the season and the Rangers’ MLB-leading 40th come-from-behind win this season. The Venezuelan native followed up his memorable effort by going 3-for-5 with a pair of home runs and five RBI in a 14-1 victory over Seattle on Wednesday. According to the Elias Sports Bureau, the 22-year-old became just the second player this season to follow a game-ending homer with two more round-trippers in his next game, joining Toronto’s Edwin Encarnacion, who accomplished the feat in June. The hard-hitting second baseman extended his home run streak the following game, homering for the third consecutive game for the first time in his career. the first second baseman in franchise history to lead the Rangers in homers. 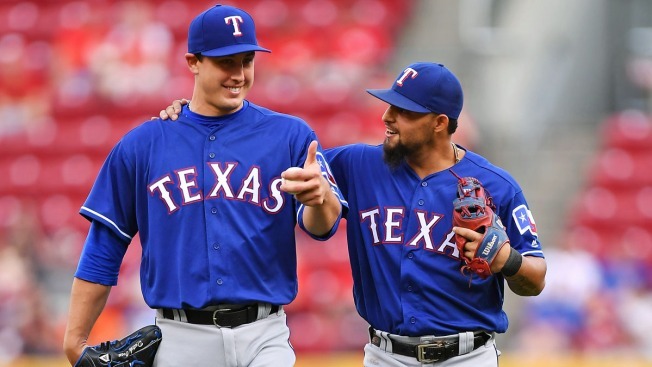 Other noteworthy performances last week included Rougned’s teammate Adrian Beltre (.375, 11 R, 3 HR, 7 RBI); Byron Buxton (.563, 1.313 SLG, 3 HR, 9 RBI) and Brian Dozier (.367, 6 R, 5 HR, 9 RBI) of the Minnesota Twins; C.J. Cron (.400, 7 R, 4 HR, 8 RBI), Albert Pujols (.429, 1.00 SLG, 4 HR, 7 RBI) and Mike Trout (.556, 8 R, 3 2B, 3 HR) of the Los Angeles Angels; Hanley Ramirez (.391, 8 R, 3 HR, 10 RBI) of the Boston Red Sox; and Jose Abreu (.412, 14 H, 4 HR, 13 RBI) of the Chicago White Sox. In recognition of his American League Player of the Week Award, Rougned Odor will be awarded a watch courtesy of Game Time, the leader in licensed sports watches, available at MLB.com.